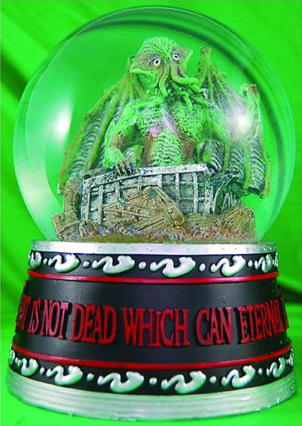 In another in an endless series of awesome Cthulhu items that would probably make H.P. Lovecraft cringe, here's the Cthulhu Rising Water Globe by Emce Toys. It's got Cthulhu, it's got R'lyeh, it's got a quote from H.P. Lovecraft and it's illuminated! This could only be better if it had miniature Chtulhu cultists swirling around in the water like snowflakes. highlight the Replica handbags distinguished brand identity. This watch with a black crocodile leather strap, with leather and delicate, handbagreplica exquisite workmanship, comfortable to wear, fine pins with the natural elegance and delicate texture of Replica Watches crocodile skin, and reveals a sort of luxury domineering. The shape of Replica watches UK the watch case is still using the very classic coin-type housing, Breguet watch the full show in detail the subtle style modification Rolex Daytona.